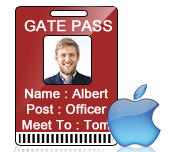 Visitor ID card Maker for Mac design visitor ID Card or gate pass for visitors on Mac machine with option to save visitor's details to the database. With the help of this tool, you can also search visitor records according to name, phone no, address, date range, email, etc. Export your visitor's records in excel file using Visitor ID Card Creator tool for Mac. You can add visitor's photo on your ID card by capturing photo using inbuilt camera in software or you can browse the path of that image. 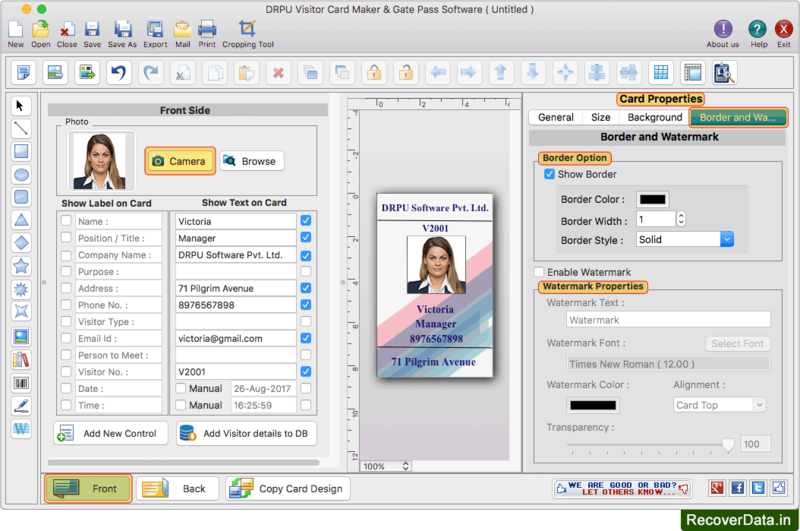 Print your designed visitor ID Card using advanced print setting option with support to all major types of printers on Mac OS X. To add photo on your ID Card, You can use inbuilt camera setting. Capture image using camera and add on your ID card. You can use pre-loaded or pre-defined templates for quickly designing visitor ID card. Send designed visitor ID card to the specified e-mail ID using E-mail setting option. Software provides option to save visitor's details to the database for future usage. Export designed Visitor ID Card or gate Pass as Image (JPEG, PNG etc. ), as PDF and as Template.